Smaller Canadian investment banks are seeing a huge opportunity in marijuana. Canaccord Genuity has been ahead of the pack since jumping into the space in 2016. But the big banks are coming — and competition will start to heat up. Canaccord Genuity, a mid-sized Canadian investment bank that's been around since 1950, is quietly dominating the emerging marijuana sector. Since 2016, Canaccord has outpaced the competition in both advising and underwriting cannabis companies, acting as the sole or joint bookrunner on more than $1.5 billion of financings and advising on more than 50 transactions, according to the firm. The firm's most recent deals include co-leading $143 million in financing for MedMen, the 'Apple store' of weed, and acting as an advisor on the $2.3 billion stock deal between Aurora Cannabis and Medreleaf — the largest merger in the cannabis sector yet. Canaccord has charted a course for success by pursuing a flurry of deals in the cannabis sector. But as legalization looms in Canada, bigger banks like the Bank of Montreal (BMO) and Canadian Imperial Bank of Commerce (CIBC) — which have yet to jump into the sector full-scale — will inevitably start to muscle their way in. Canada will be the first G7 country to legalize marijuana at the federal level later this year, allowing Canadian companies to capitalize on the sector. This has provided an opening for Canaccord to become the go-to bank for cannabis companies. As a middle-market firm, Canaccord can afford to take risks that bigger banks and most US firms can't, which is why it was able to get into the sector early and devote serious resources to building out the business. "We knew there would be capital markets appetite and opportunities, as a result, to get in early, especially given the Canadian legal framework versus rest of the world," Pat Burke, President of Capital Markets at Canaccord, told Business Insider in a recent interview. "From there, it evolved into a much larger effort." The story of Canaccord's presence in the space started about "four or five years ago," Graham Saunders, the firm's Head of Origination told Business Insider, when now-Prime Minister Justin Trudeau campaigned on a promise to legalize marijuana. Saunders said he took a lot of meetings with up-and-coming companies — mostly on the medical side of the industry — but the firm took a "wait-and-see approach" before writing any checks. "You know, from a personal perspective, I was a fan of the sector," Graham Saunders, Canaccord's Head of Origination and one of the leaders of the firm's push into cannabis, said. "I knew it existed, right? We knew that the cannabis market existed — as a black market. So from that standpoint, I was a fan and I was investing personally in the cannabis market four or five years ago." As a public company, Canaccord had to tread carefully. "We wanted to be careful and [with] these early companies that got financing, there was a lot of bad news and we didn't want to take the risks of being associated with companies that had done wrong," Saunders said. Some of the earliest companies to operate in the cannabis sector ran afoul of regulators, creating a layer of reputational risk for investors that put money into them. Canaccord first got into the space in February of 2016, helping a small Canadian grower raise money. From there, the firm ramped up its presence in the sector — and business has boomed since. "I'd say our timing was perfect when we came in in 2016 and leading into 2017," Saunders said. "That's when the sector really started to take off." "Now that we are fully immersed in it, we literally have dozens of capital markets professionals around the world involved in this space," Saunders added. "So there's no bigger investment bank in the world in the cannabis sector than there is here at Canaccord." Since investing in that small Canadian producer, the firm has created a dedicated team covering the cannabis sector, with two analysts, Matt Bottomley and Neil Maruoka, assigned to cover a host of companies across both the medical and recreational sides of the industry. In January, the firm hired a San Francisco-based banker, Shannon Soqui, to head up its US cannabis business. Beyond expanding its team, Canaccord has advised on a number of M&A deals, including Aurora Cannabis (on its $1.2 billion acquisition of CanniMed Therapeutics), and Nuuvera (on its $787 million sale to medical cannabis company Aphria). Canaccord also co-led the financing for MedMen's listing on the Canadian Securities Exchange, and led the IPO for Cannabis Strategies Acquisition Corp — a holding company set up to make acquisitions in the cannabis space — on the Toronto Stock Exchange. Earlier this month, the firm held its second annual cannabis conference in New York, which saw over 50 companies present to an audience of over 600 people. "Business has been terrific," Burke said. "I mean we've led the space under all sort of capital markets slash volume type of statistics. And there's lots of opportunities still ahead." Canaccord is keeping a close eye on large alcohol companies, who, according to Saunders, are starting to "sniff around" the cannabis industry as alcohol consumption declines in places where cannabis is legal. In states that have legalized cannabis, binge-drinking rates have fallen 9% below the national average, and 11% below states that don't allow the sale of recreational marijuana, according to a note from Cowen. CIBC, one of Canada's largest banks, predicts that marijuana will be a $6.5 billion industry by 2020 in Canada, eclipsing liquor sales. Constellation Brands, the third-largest beer company in the US, paid $191 million for a 9.9% stake in Canopy Growth, one of the largest Canadian marijuana producers in October of last year. "We are in active discussions with a number of large beverage companies that...are minimum taking a look or studying the subject matter," Saunders said, though he declined to name specific companies. The other big trend, according to Saunders, is on the pharmaceutical side of the cannabis sector, as biotech and pharma companies spend more money researching the plant — and start to go on acquisition sprees. "There's just a lot of science that needs to be done to figure out what sort of products are going to come out from this," Saunders said. "So it's pretty exciting to me." It's already happening. Sandoz Canada recently partnered with Tilray, a cultivator in British Columbia, to distribute "non-combustible" (that is, pills and sprays) medicinal cannabis products to Canada's major hospitals and pharmacy chains. "We don't know how big it's going to be from the pharmaceutical side," Saunders said, adding that he sees a "macro trend" of research and development of cannabis-based drugs. "I think you're going to see pharma at the right time, be a huge investor, and make acquisitions in the space." While Canaccord is dominating the cannabis sector, it won't be long before bigger banks — both in Canada and the US — start to muscle in on its turf. "Obviously this is going to be a big global industry and it's going to attract all the players at some point in time," Saunders said. For now, Cannabis is still a Schedule I drug in the US (though it's legal in a number of states) which means that large, institutional investors aren't yet jumping into the space, fearing US regulators. Big Canadian banks with lots of exposure to the US market, for example, aren't going to lend money to US-based cannabis companies until the plant is legalized, or at least policies are put in place to rectify the contradiction between state and federal laws, Burke said. In the US, most of the investors in the space are cannabis-specific firms designed specifically to operate within murky regulations around cannabis. But that could change. There are a number of bills circulate around Capitol Hill that could potentially allow big banks to write checks and underwrite deals without breaking federal law. Firms that manage hundreds of billions of dollars, like BMO and CIBC (the fourth-and-fifth largest lenders in Canada, respectively) are now starting to dip their toes into the sector. CIBC started covering the sector earlier in May, releasing its first report in anticipation of these changes. 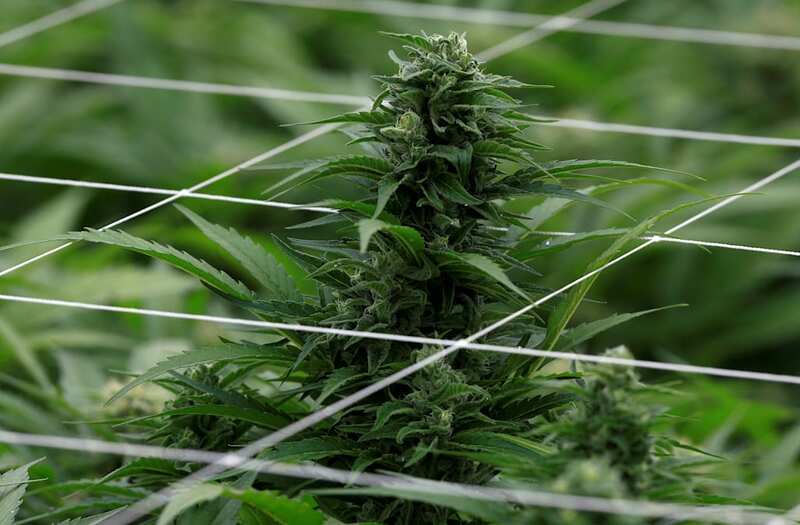 And BMO advised Aurora Cannabis on the $2.3 billion Medreleaf deal — with Canaccord acting as an advisor to Medreleaf — in yet another sign that competition is starting to heat up. BMO's Capital Markets team now occupies the second spot for advising on Canadian pharmaceutical acquisitions, behind only Canaccord, reports The Financial Post. Big investors are starting to open up to cannabis in the US as well. Tiger Global, a New York-based firm with $22 billion under management, led a Series A round into Green Bits, a cannabis-tech firm in April. According to many conversations Business Insider has had with major players in the cannabis sector, institutional investors have started to take some meetings with cannabis companies, though they're held back from investing because of marijuana's federal status. For now, Canaccord isn't worried — the firm is working on planting flags in all the major growth centers of the industry. "From a capital markets perspective, we still see our ability to extend our lead just because we're not held back by that same risk profile," Burke said. "Right now we have a really unique opportunity to continue to be out in front of it because we're not held back like some of our competitors."